It says that it has an STM32F411CE with 2.5MB of Flash and 128kB of SRAM. Sounds like something that could maybe run Micropython? I got these from going to the boot loader by holding down the boot switch and pressing reset. There's 464k in that application slot. If I try to load this module, it will wipe out the bootloader. The SWD clock and data are available on the EWM3165. Anyone have experience using the VLINK on a Discovery board to jump another device? You can easily connect EMW3165 to Diiscovery ST-LINK SWD port. Remove CH3 jumpers and connect SWCLK, GND, SWDIO, NRST from CN2 to EMW3165. No need to connect VDD. Update st-link firmware first, than you can read the content of the flash and save it as backup. I've tested it with WiFiMCU board. Are there any news regarding possibility of MicroPython running on this MCU? Anyone working on this? Seeed has the EMW3165 module for $7.95 with a $21 EMWE - 3165 - A Development Board, Banggood.com has the WiFiMCU EMW3165 for $11 with free shipping. The WICED SDK comes with everything including the tool chain when you launch Eclipse you can import a project and burn it in minutes (with a break for coffee). Well, let's hope Seeed works on this - that's their hardware, they sell it, and they are in good position to support software development for it. 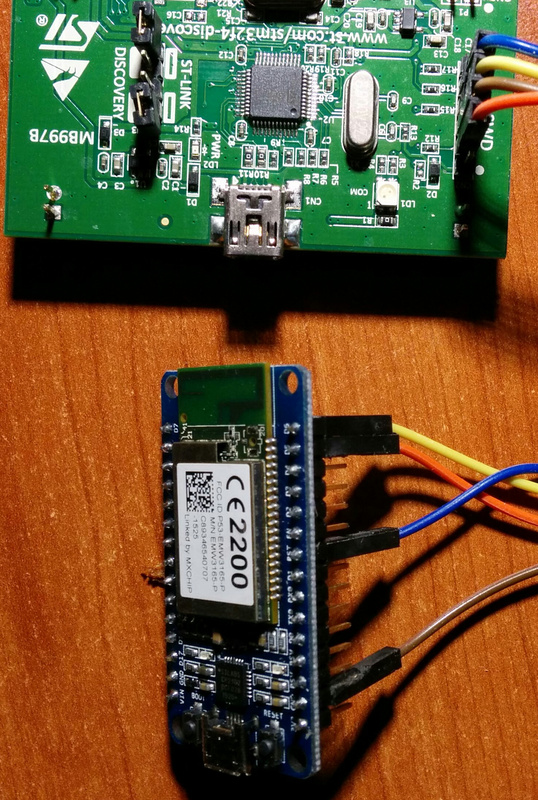 Ordered one together with wifimcu board as well, aliexpress has a discount on them. I guess the progress depends on the involvement of devs. I'd be interested to poke around if there is more info available than what we had at the beginning of ESP discovery. Opps, sorry for digging up a 3yr old post.